We’ve helped thousands of residential, commercial and corporate clients with projects ranging from big to small. Choose from 4 sizes. Guaranteed in 4 hours. All with unmatched customer service from one of the most trusted names in the business. Western Elite is one of the biggest recyclers in Nevada. 100% of all collected waste materials are sorted for recyclables before shipment to the landfill. Our front load service can kick-start your recycling program and help you do your part to keep our planet green. Western Elite Environmental is a state-of-the-art facility with the latest technology in engineering and operations. It allows us to offer a complete solution for the collection, storage, removal, recycling and landfill disposal of your waste. YOU CHOOSE WHAT GOES INTO OUR CONTAINERS. WE’LL GUARANTEE WHAT STANDS BEHIND THEM. 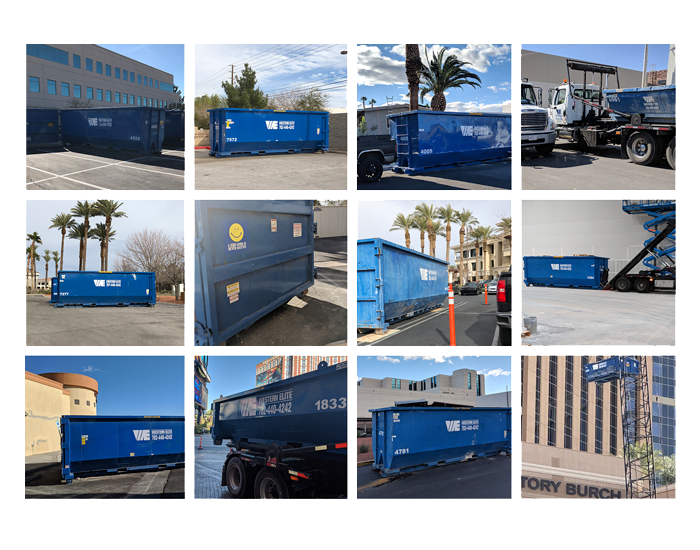 Behind Western Elite is a dedicated team of professionals who provide custom solutions for your waste and recycling needs in Summerlin, Henderson & greater Las Vegas. We are ready to earn your trust for the long haul and our commitment to “unmatched customer service” provides peace of mind in knowing that we will always stand behind every promise that we make. You have waste. We have solutions. Let’s get to work.